In 10 or 12-inch skillet, heat water, lemon slices, onion slices, parsley sprigs, 1/2 teaspoon salt and the pepper to boiling. Boil 3 minutes. Reduce heat to medium- low. Add salmon, skin side down. Cover and cook 5 to 6 minutes or until salmon flakes easily with fork. Remove salmon from liquid in skillet. Cool completely. Cover and refrigerate at least 2 hours but no longer than 24 hours. Discard liquid in skillet. In small bowl, mix lemon juice, honey, mustard and oil until well blended. In another small bowl, mix chopped parsley, red onion, capers and lemon peel. 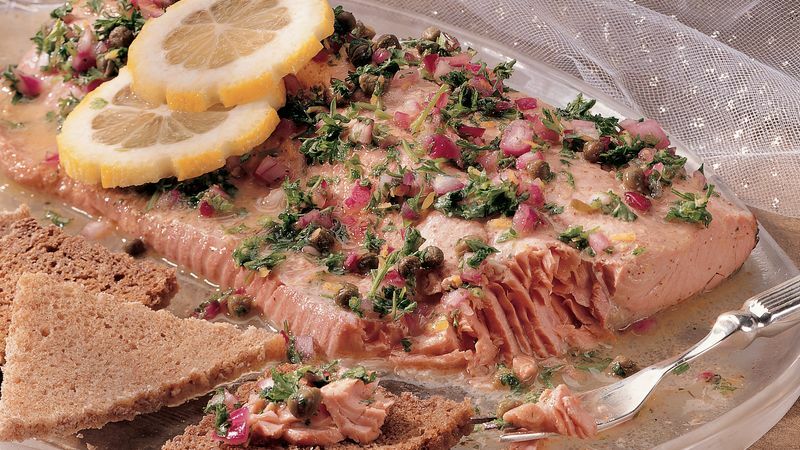 To serve, carefully remove skin from salmon; place salmon on serving plate. Sprinkle with 1/4 teaspoon salt. Drizzle honey-mustard sauce over salmon; sprinkle with parsley mixture. Serve with bread slices. Most of the salmon eaten in the United States comes from the Pacific Northwest. Chinook salmon, also called king salmon, ranges in color from off-white to bright red. It is the most expensive and has the best flavor of the salmon sold in the U.S.